Matthew Murrey Design was commissioned to create a contemporary landscape design for this home in Dallas, Texas. The homeowners were seeking a design that would match the same level of finish out on the outside of their home as on the inside. It was important to the client, that their place be a complete and cohesive thought verses a collection of ideas. With the back of the house consisting mostly of glass, it was very important that the aesthetics of the pool, patio, and landscape be an extension of the interior design (Wyll Interior Design photos here). Since the home backs up to a heavily wooded area, Matthew Murrey Design chose to use minimalist planting and structures in an effort to incorporate the natural landscape with the house. By playing off the clean-lined, contemporary architecture of the all-white, stucco house, and keeping with the predominately neutral palette of Wyll’s interiors, Matthew Murrey Design created a landscape that fuses nature with a sophisticated contemporary design using high end, sustainable materials to create a cohesive masterpiece. The backyard steps down to a negative edge pool that sits centered on the main axis of the house allowing for uninterrupted views of the expansive wooded area behind and below. A covered outdoor kitchen and seating area with granite bar, stainless steel appliances and taupe furniture provide an intimate area to gather with friends, entertain, and cook. To keep the project cohesive and simple, concrete was selected as the sole paving material from the front drive to the back pool and terrace. To create rhythm and add interest to the large motor court at the front of the house, a pattern was created and highlighted with charcoal grey concrete. In the back of the house, the paving was designed as a monolithic pour to overhang the pool instead of using a separate material for pool coping – visually maximizing the space. 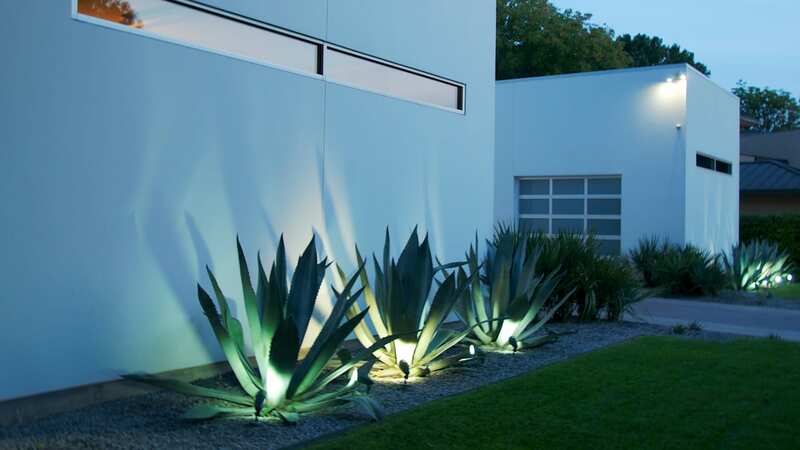 For the vegetation, Matthew Murrey Design used plantings of dwarf sabal palm, agave and Bright Star yucca to provide structure and contrast against the neutral tones of house and paving. Furniture accents, pottery and finishes were also kept in the same neutral color family. Stainless steel and metal accents enhance the clean, polished feel of the home.